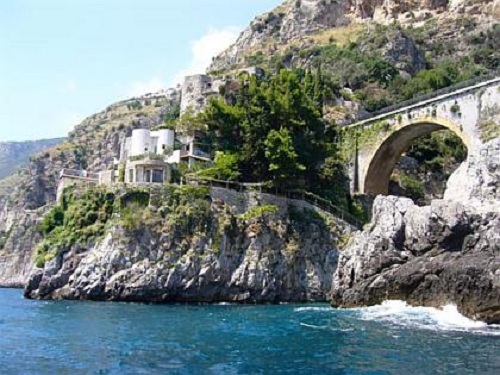 Following the hairpin curves of the road cut along the coast between Amalfi and Positano, you will arrive in the charmimg little town of Furore, "il paese che non c'e' ( the town that is not or Italian Neverland). 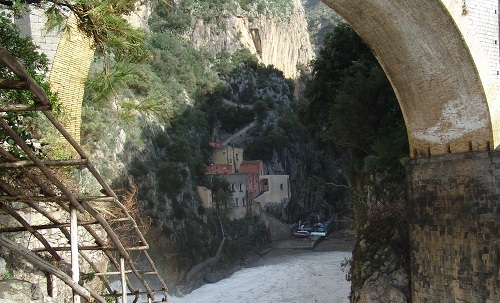 It all consist of a loose group of houses sprinkled across the rocky cliffs, built sheer to the sea in order to protect the fields and the countryside, thanks to the particular geographical conformation, Furore has always been a very important and susceptible stronghold, even at the time of Saracens' incursions. The most attractive thing about this village-non-village is its beautiful setting: the olive trees, the grapevines on terraces going up the mountainside, the bowers of lemons with nets stretched between poles, the red roofs and colorful majolicas on the small bell towers, the brilliantly colored flowers of the wild blackberry brambles, and the sea: blue, down below, in the corner of your eye, ever present. 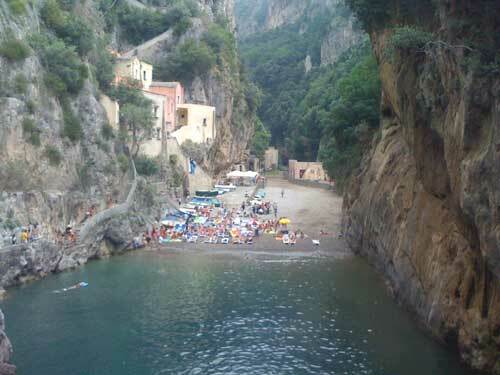 PS : Furore is a mountain village, reaching it by car might be a bit intimidating, once there you can walk down to the hamlet on the beach which consist of a fishing village. In the picture below is visible the trail leading to the small beach below the bridge. The best avenue would be reaching the hamlet by boat and then climb the narrow winding path to town. Getting there : Take the Naples-Salerno motorway, exit at Castellammare di Stabia to Gragnano - Lettere - Agerola - Furore - Distance from Naples is approximately 42 km. Avoid weekends especially between July and August. Parking is hard to find. You might consider driving to the nearby town and then take the bus. The houses,(above picture) today inhabited have been transformed into an interesting Ecomuseo, which consists of several sections: the paper-mill, the paper drying room, the herbarium and the museum Costadiva . 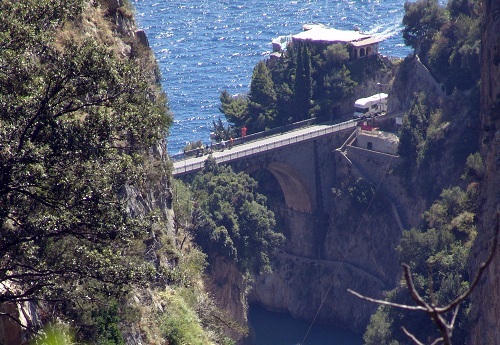 The municipality expands from the sea with the hamlet of Fiordo situated at the foot of the cliff. 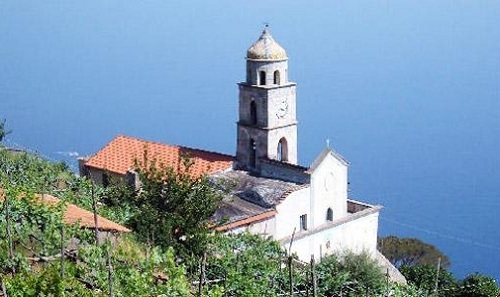 The village is subdivided into 3 districts (contrade): Cicala (Sant'Elia), Ciuccio (Santo Jaco) and Gatta (Sant'Agnelo). Here you will walk through tiny alleys and narrow plots of a land miraculously torn away from the mountain and cultivated with lots of love. 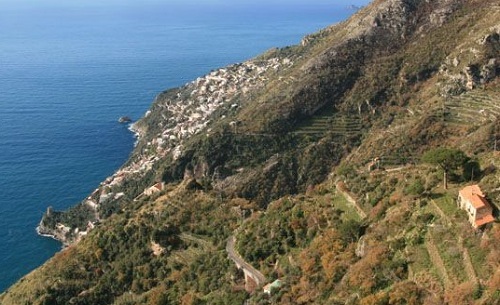 A mountain pass built during the Republic of Amalfi is the only connection between sea and mountain. 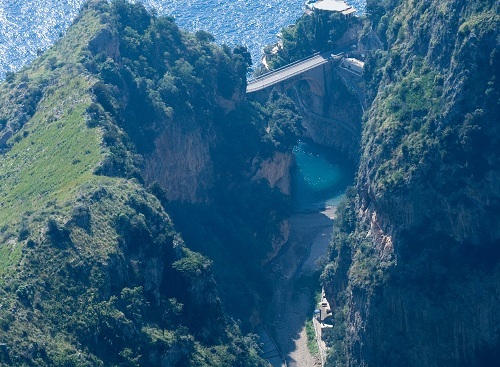 Furore (Fury) takes its name from the "the sound of the raging sea pounding against the valley below". The fjord, one of the most picturesque and evocative in Italy, has always been a natural harbor, famous for its flourishing trade and the development of the old industrial plants, such as paper mills and mills. The town has been renowned from time immemorial as small coastal territory, lacking in cultivable lands and scarcely populated. 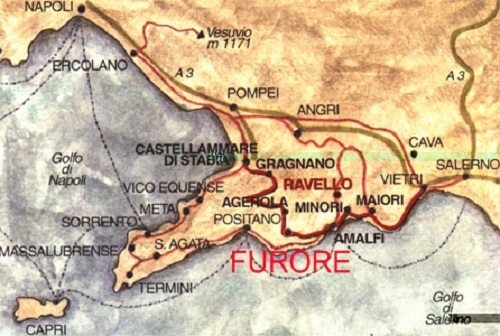 Furore was a simple district of the Royal city of Amalfi: a place where the exiles and the outcasts of society lived, once sent away from city, in an inhospitable, sparsely populated area with no lands to cultivate. This might be the reason why someone thinks that the first inhabitants, (which became able fishermen, artisans and farmers), originally were Amalfi's refugees, forced to live in this inhospitable place, because exiled from their home town. 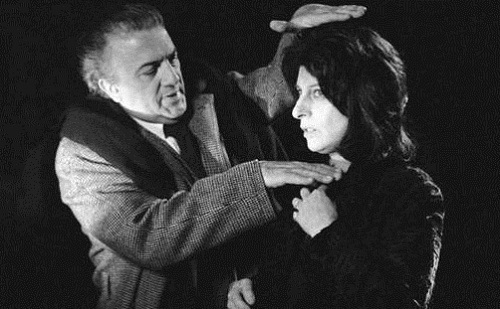 Furore was the set of a famous film "L'Amore" and, at the same time, of the passionate and tormented love affair between director Roberto Rossellini and famous Italian actress Anna Magnani. 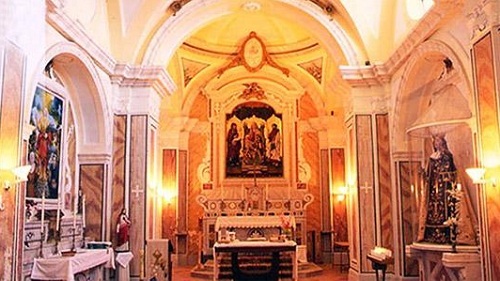 Things to see: Among the major historical, architectural and natural sites of interest, not to miss: the Church of St. James the Apostle (or Holy Jaco), dating back to the XI century, built on the ruins of an antique rural church. The structure is flanked by a multistory bell tower, topped by a spire covered with majolica mosaic tiles. During the last renovation, in the spaces below the right aisle, a small series of frescoes of the school of Giotto were brought to light, reproducing scenes of life of Santa Margherita. 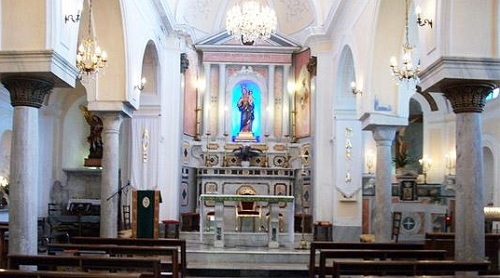 The Church of St. Michael the Archangel, in Baroque style, although very simple in style, it features three naves with pointed arches supported by baseless columns with simple capitals. The Church of St. Elias, dating from the XIII century, and built in a suburb area of the village. Inside it preserves a precious wooden triptych representing the Madonna with Saints Bartholomew and Elia (1479) by the artist Angelo Antonello from Capua.